R.J. Rushdoony: 01:15 God said, “Behold, I have given you every herb bearing seed which is upon the face of all the earth, and every tree, in the which is the fruit of a tree yielding seed, to you it shall be for meat. And to every beast of the earth and every fowl of the air and to everything that creepeth upon the earth wherein there is life, I have given every green herb for meat, and it was so.” God saw everything that he had made, and behold, it was very good, and the evening and the morning were the sixth day. R.J. Rushdoony: 01:52 As we begin our study in the meaning of Biblical law, we shall deal with the law first of all as revelation and treaty. Before we begin our study of Biblical law, however, it is important to recognize certain general facts concerning law. First of all, law in every culture, in every civilization is religious in origin. There is no place in the world where we can go where we can find law that is not religious. Law reflects what men believe to be is basically right and wrong in a society. It reflects the ideas of culture, of justice, of ultimacy. As a result, law is inescapably religious because your idea of justice, your idea of morality is a religious idea. Now, this does not mean that these various concepts of law are congenial to scripture. The religion they represent may be Buddhism, Mohammedanism, animism, Hinduism, and increasingly today, humanism. But law is in every culture, without exception, inescapably religious. R.J. Rushdoony: 03:49 Second, in any and every society the source of law is the god of that society. The easiest place to locate the god of any system is to look to the source of law. If the courts are the source of law and there is no higher law beyond the courts, the courts have made themselves god, as is increasingly the case in our society. If the monarch rules absolutely and makes himself the ultimate law giver, then he is a god. If it is the people, according to the theory of democracy, who are the source of law, then the people are the god of that society. In Marxism, it is the people as they find voice in the state. Mao Zedong has said, “Our god is none other than the masses of the Chinese people.” But the voice of this god can only be the Communist Party. In any and every law system, the source of law is the god of that society. R.J. Rushdoony: 05:18 Third, it follows from this that any change of law, any change of law that affects the basic law structure of society is a change of religion. This is exactly what we have been undergoing for the past generation or more in this country. A change of religion, and very steadily, our law system has been changed in order to provide us with another religion while we are assured that there is total toleration for all religions. But humanism is now the religion and provides the law system of our American society as it does of virtually every country in the world. R.J. Rushdoony: 06:16 Fourth, it follows from this that there can be no disestablishment of religion in any society. You can disestablish a church, but you cannot disestablish religion. A society must either have the Christian religion established or it will have the humanistic religion or Buddhism or Mohammedanism, or something else, because it must have a basic faith to provide the concept of justice, the moral code, the law system for that society. The attacks you find today in our court on capital punishment, on restitution, on the idea that the criminal is guilty or that the alcoholic is guilty, all these constitute an attack upon the Biblical law system. The Biblical law system is being disestablished together with Christianity as the religion and law basis of American society as well as English, Canadian, France, German, all Western societies. R.J. Rushdoony: 07:59 Fifth, it follows from this that there can be no toleration in any law system for another religion. You can tolerate various churches of a particular religion, various interpretations, but you cannot tolerate another religion, because then you are saying that you are tolerating total revolution. You are tolerating the overthrow of your law system of your political order, of everything. By tolerating humanism, this is exactly what we have done. Humanism is at present in the mocking upstages of its revolution against Christianity. Now, with these five points with respect to law in mind, let us turn to our law system, Biblical law. Biblical law made possible the tremendous growth and progress of Western culture, in particular because Biblical law was so basic to the establishment of this country, it made possible the tremendous growth of this country. In analyzing Biblical law, therefore, it is important first of all to note three characteristics of Biblical law. R.J. Rushdoony: 09:53 First of all, for the Bible, law is revelation. The very word for law in the Bible is torah. Torah, T-O-R-A-H. Now, the Jews use the word Torah for the Mosaic Law, but in the Bible, the word torah is used for the whole of the Bible, for the prophets as well as for Moses, for the books of history, for everything. It means divine instructions, the divine word, the divine teaching. So the whole of scripture comes to us as the one word, the one law of God. It is not possible to distinguish between the Old and New Testaments as one giving law and the other grace, because the very premise of the giving of the law to Israel-. R.J. Rushdoony: 11:00 … because the very premise of the giving of the law to Israel was the grace of God. Because God was gracious unto them, therefore, he was giving them his law. This is definitely stated both in Exodus and Deuteronomy before the giving of the 10 Commandments, that this is an act of grace … The law and grace are inseparable. The Bible never speaks against the law in the sense in which the Bible intends it, that is in the biblical, the Mosaic, the Christian meaning. When our Lord and Saint Paul spoke of the law as misused and attacked the law, they were not attacking the law in itself, but the false concept of law which had developed among the Pharisees. R.J. Rushdoony: 12:12 The law had been made into a mediator, into a savior. Jesus Christ, because he came as man’s mediator and savior, attacked the idea of the law as mediator. In other words, the false idea of the law, but he said from the beginning that he had come not to destroy the law but to fulfill it and to make known the fullness of its meaning. Jesus never set aside the law. He only attacked the misuse of the law. The law was so seriously taken by the early Christians, that when Saint Peter received word from Cornelius to go into his home and baptize him, because it involved a break with something that he believed with respect to the law, it required a special revelation from God for Peter to go. Only the fact of revelation made his baptism of Cornelius acceptable to the church. In other words, the Christians, instead of being against the law, were so strongly for it that it took a revelation to move Peter when he felt that it might involve a violation of the law. This is how seriously the law was regarded. The law for scripture is a revelation. R.J. Rushdoony: 14:12 Second, the biblical law is treaty or covenant. This is an important fact. It is a contract. It is a contract which God enters into with man as an act of grace. Man does not deserve anything from God’s hands, but God, in his sovereign mercy, gives man his law and summons him to be his people. Now, in Sunday school picture books and Bible story picture books, when Moses is shown with the two tablets of stone coming down from the mountain, one tablet will be pictured as having five commandments and the other five, sometimes four and six is the arrangement, and this is altogether wrong. In reality, each of the tablets had all 10 Commandments written, perhaps on both sides, but all 10 appeared on each of the 10 Commandments. Why? Because this was a treaty and a contract, a covenant. R.J. Rushdoony: 15:40 Now, when you enter into a contract with someone else, there are two copies of that contract, one for each party … so that each party might know the terms thereof. Now, the 10 Commandments as the summary of the whole law of God was given to Moses in two contracts, two copies, so that both as they were placed in the most holy place would be there as a witness. There was the meeting place of God and his people. There the two copies of the treaty, one for each party, were kept as a reminder to both of the terms of the treaty, of the covenant. R.J. Rushdoony: 16:43 The language of the giving of the law is exactly the same language that you find in the ancient world in all treaties. In this case, the sovereign, the suzerain, was God. When his mercy gave to those whom he took under his protection, even as an emperor entered into a treaty with the small powers around him, and declared that if they would obey him and yield him tribute, he would protect them. The law gives a sovereignly- dictated order of life. It governs the total life of man. For the law, there is no distinction between the inner and the outer life of man. Both are governed by the law. This appears, for example, in the 10 Commandments, for example, in the 10th, “Thou shalt not covet.” Here, the inner life of man is governed, as it is in a wide variety of laws. It is a treaty, and the terms of the treaty affect the total life of man, every fiber of his being, every thought of his life. Because it is a treaty, there are very definitely blessings that follow obedience to the treaty and curses that ensue for disobedience to the treaty. If the treat is violated, judgment follows. R.J. Rushdoony: 18:54 The third aspect of biblical law is that it constitutes a plan for dominion under God. In Genesis one, when God created the heavens and the earth, and he created man, he created him to have dominion over the fish of the sea and over the foul of the air, over the cattle, and over all the earth and over every creeping thing that creepeth upon the earth. This is the foundation of biblical law. God created man to have dominion over the earth. This is stated emphatically not only in the first chapter of Genesis, but in the second and throughout scripture. When after the flood, God called Noah and made a covenant, or renewed the original treaty with him, he summoned Noah to exercise that which he had called Adam to do, to govern the earth, to subdue the earth, to have dominion over it. This was, again, renewed, this treaty, in Abraham, in Isaac and Jacob, through Moses with all Israel, with David and Solomon, with Hezekiah and Josiah, and in Jesus Christ, we have the New Testament, or the renewed covenant. R.J. Rushdoony: 22:02 It means that Jesus Christ says that I, by my atoning work, take you who are fallen and sinful and unable to do that which God called you, to exercise dominion over the earth, and I reestablish you by my justification and my regenerating work in your calling. So, what does the Lord’s Supper do? It reestablishes the law. It summons man again to exercise dominion over the earth under God. It declares that the purpose of Christ’s coming is to restore God’s purpose, that man under God should exercise dominion over the earth. The people of the law are now the people of Christ. Christians are called now to inherit the earth, to exercise dominion over it. R.J. Rushdoony: 23:23 The biblical law is therefore the law for Christian man and Christian society. The biblical law was applied very early, and it made possible the growth of Christian Europe. Feudalism was an application of biblical law. The words “feudalism” and “federalism” are closely related. R.J. Rushdoony: 23:59 Feudalism simply meant a decentralized, local kind of government with very little authority at the time. There were all kinds of varieties of local government under feudalism. There was the local lord and his manor. There was the local township. There were the local [inaudible 00:24:21], owned by the farmers who governed themselves. There was a wide variety of farms of local self-governance. R.J. Rushdoony: 24:34 But it was an application fundamentally of biblical law. What the Puritans did was to revive this and apply it to this country. The bible was the law of this country for the first two centuries or more. But as a result of scholasticism, a revival of Greco-Roman, especially Roman concepts of law came in. These exercised throughout the latter Middle Ages and on the Reformation a preponderant influence. R.J. Rushdoony: 25:20 For example, Calvin, who otherwise was so perceptive in his analysis of scripture, nevertheless says in his “Institute,” “The nations need not follow biblical law but the common law of nations.” Now, the common law of nations was Roman law, natural law. But, if you do not follow biblical law, you disestablish the Christian religion. 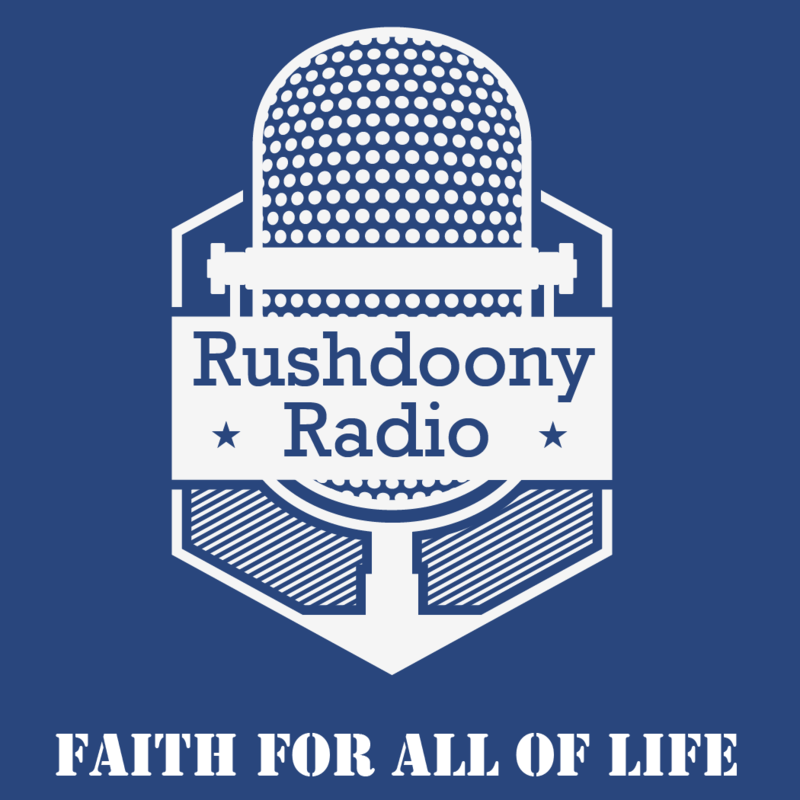 R.J. Rushdoony: 25:58 The Roman concept of natural law is a humanistic idea, is it not? It assumes that nature as it is is normative, that it is not fallen, that it is good, and therefore truth flows naturally out of it. As Christians, we do not believe there is a law in nature but a law over nature. To follow the society of the common law of nations or natural law is to go astray and to become humanistic. Since both Catholic and Protestant scholars did this so extensively in modern times, is it any wonder that they find society around them becoming humanistic? Is it any wonder when they go out in the mission field, their pupils turn out to be humanistic revolutionaries? R.J. Rushdoony: 27:11 For example, two European theologians have written concerning the state that, and I quote, “it is to be God’s servant for our welfare, it must exercise justice.” That sounds fine, and it’s biblical. But if you deny biblical law in favor of natural law, how can the state be God’s servant without God’s law? They say that the state must exercise justice, but what is justice? There are as many definitions of justice as there are religions. Our problem today, is it not, is that we have the humanistic idea of justice being rammed down our throats when we deny it. We believe in the biblical doctrine of justice. R.J. Rushdoony: 28:14 It is no wonder that these two European theologians then go on to say a little later, and I quote, “A static legislation valid for all times is an impossibility.” A static legislation valid for all times is an impossibility. They’ve just parted company with God, have they not? Because God says, “Thou shalt not kill” is valid for all time. And “Thou shalt not steal” is valid for all time. You either stand in terms of revealed law, or you do end up in a relativistic law where nothing is valid for all time, and the law can change because truth changes. R.J. Rushdoony: 29:18 The law for the state therefore must be revealed law. It is the only means whereby man can fulfill his creation mandate of exercising dominion under God. Apart from revealed law, man cannot claim to be under God but only in rebellion against God. Let us pray. R.J. Rushdoony: 29:59 Our Lord and our God, we give thanks unto Thee that Thou didst create us to be Thy people and to exercise dominion over the earth under Thee. We thank Thee that we, having gone astray in Adam, have been recalled in Jesus Christ. The mandate has been renewed to exercise dominion. Give us grace therefore to do these things in Thee and of Thee, to proclaim the glory of Thy law and the certainty of the judgment as well as the blessing of Thy law. Make us strong in Thee by Thy Holy Spirit, that we may be more than conquerors through Him that loves us, Jesus Christ our Lord. In His name we pray, amen.